Glass Agencies EROSE are manufacturer of Drawing Model Set. Exposure to various global methodologies like Indian (Vedic), German, Russian, Scottish and Chinese methods along with conventional methods. Making you more competent with a wider choice of problem solving skills. Helps learn new methods in four basic operations of math. Easy to understand, easy to apply and easy to remember. 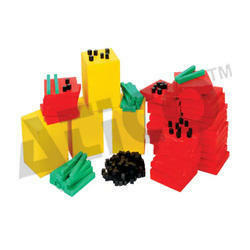 We are offering various types of Number Rods. It is a set of 10 wooden rods painted in red and blue colour. The length of the rods are 10 cms, 20 cms to 1 meter. The width and height of the rods remain constant. Our organization offers a high quality range of working models (biogas plant), which are specially used in various organisation. We, at Punjab Scientific & Educational Aids, provide complete Senior Mathematics Kit. 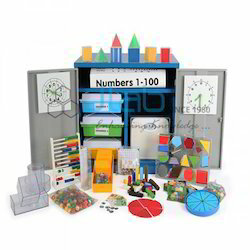 These Senior Mathematics Kits are specially meant for the senior students to help them learn complex mathematical concepts in comparatively fun way. A box with gradations of roughness, containing five pairs of rough tablets with five different gradation likewise five pairs of gradation in smooth. - Each color has squares of numbers from 1 to 10. Online Kits are designed specifically for Educational & Research Institutions to set up Labs on Imaging, Machine Vision, and Biometrics etc. for “Teaching, Learning and Development. The kits include training material, tutorials, real world project development tools, related accessories, conceptual experiment setups etc. A must but for every new born. These stacking ring helps to learn colour, shape, size and helps in the overall development of the child. Pairs of sentences and associated pictures for reading. There are 4 pouches and the sentences in each pouch focus on a particular concept like colours, articles, prepositions and adjectives. Plastic coated and Most Important Real Pictures with WIPE and CLEAN facility. CHECOLO is a logically appealing, competitive and fast-paced game for the entire family. Combining the logic of Sudoku puzzle (using colour tokens instead of numbers) and the strategy of Checkers board game, the excitement of this game is raised to a new high. This unique combination makes the game play closely contested and for players who have gained a level of expertise, every move counts.